For printing our articles please copy the web page by highlighting the text first - then click copy in the browser- paste the article into a word program on your computer. When the text is transferred into word, click to save or print. It has been said to steady the mind, calm the emotions, and tone the body. It claims that it is a way to Promote fitness, flexibility, and relaxation and It can be practiced in groups or by oneself at home. �Nationally, yoga is a $22.5 billion industry. Advertisements for yoga books, videos, clothes, wellness retreats and even yoga business training classes can be found in the back of magazines such as Yoga Journal, and the phenomenon is now reaching into the mainstream. Hatha yoga exercises are taught as part of YMCA physical education programs, in health spas and given as physical exercise on TV programs. Eighty percent of clubs now offer yoga classes. Yoga is also incorporated into institutional and liberal churches on the assumption that these techniques are nothing more than benign physical exercises which condition the mind and body. It has come in under the guise of stress reduction. Touted as scientifically proven is more an assumption, that is really at worst, presumption. We probably all have seen Lilias on her PBS TV series introduce people to the benefits of this physical exercise. She has become an American icon for yoga, promising amazing affects from vitality, tranquility to greater concentration. Richard Hittleman was one of the first to have a television show on yoga. Now the exercise classes are being carried on TV as a new resurgence of interest is taking place. Newsweek magazine reported that �yoga classes are in demand at urban health clubs across the country, and longstanding yoga studios in New York, Chicago, and California report sharp rises in attendance in the past years. It is estimated that there are 10,000 yoga teachers in the United States (now up to 70,000) who teach between 4 and 5 million students a week (now up to 35 million). Newsweek also noted that �such high-profile practitioners of the 6,000-year-old art as Kareem Abdul-Jabbar and Raquel Welch (whose exercise videos are promoting yoga). Yoga's popularity has grown especially as of late. Peter Jones in his Christian Witness to a Pagan Planet e-newsletter reports that Twenty million Americans practice Yoga�including Madonna, Oprah, Gwyneth Paltrow, Monica Lewinski, Hillary Clinton, Phil Jackson (with many L.A. Lakers) the Gores and Sandra Day O�Connor, of the Supreme Court. Because Hollywood is involved it has brought it more attention to the practice.� Time magazine Also reported that the Berkeley-based Yoga Journal has nearly doubled its circulation over the past five years. The widespread teaching of yoga in America today, is probably, due more to a tolerant attitude toward the religions of other cultures than it is to an open mindedness about whatever wisdom may be extracted from it. It seems to the secular population that is being targeted to accept only that selected aspect of yoga which fits their naive notion. That what yoga is supposed to do, is to relieve stress and make a fit and beautiful body. Many participants merely presume that the exercises are neutral, harmless, if they are not practiced with any spiritual intent. After all it only bodily exercise! But the fact remains that even physical yoga is inextricably united in the whole of Eastern metaphysics. I personally had practiced yoga and meditation and at times was quite dedicated. It was something I believed in, as I tried to work my way to be in tune with the universe as well as my body. 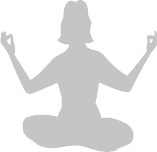 One of the early pioneers of Hatha Yoga, Richard Hittleman, (who was a personal influence to practice Yoga) �stated that as yoga students practiced the physical positions, they would eventually be ready to investigate the spiritual component which is �the entire essence of the subject�� (Yoga Journal, May/June 1993, p. 68 Quote from http://cana.userworld.com/cana_yoga.html ). This is how I began a spiritual journey into meditation. One practice led to another as I wanted to grow in my spiritual pursuit. From this spiritual philosophy I learned to be a vegetarian, thinking I was cleansing the temple for the energy to flow unobstructed. While vegetarianism can be helpful to some people that are unable to digest meat, it is not the optimum diet for all. It can at times make one unhealthy if they do not get sufficient vitamins and minerals. This practice is ancient but can be traditionally traced to approximately the 200 B.C., To a man named Patanjali. Who is credited with being the originator of the yoga system. His work is a collection of many short terse sentences which convey the barest minimum of teaching about yoga. The rest was learned from his teacher personally. Little is known about him; he was supposedly a physician, Sanskrit scholar, a yoga practitioner (yogi), a teacher who lived in India. Some authorities believe that he was more of a cataloguer than an author, and that he did not originate this practice, but collected and edited the teachings from traditions and is credited for its revival. Yoga was introduced by Hindu's Lord Krishna in the Baghavad Gita as the sure way to Hindu heaven. In one of the most authoritative Hatha Yoga texts, the fifteenth-century Hathayoga Pradipika, Svatmarama lists Lord Shiva, (one of Hinduism's most feared Hindu deities, called �The Destroyer�) as the first Hatha Yoga teacher. Shiva is addressed as Yogeshzuara, or Lord of Yoga. There are many types of Yoga. Besides the Ashtanga Yoga of Patanjali, - the most famous forms of yoga are those described in the Bhavagad Gita, the Hindus sacred scriptures. The best-known part of the epic Mahabharata, the Gita mentions Karma, Jnana, and Bhakti Yoga. 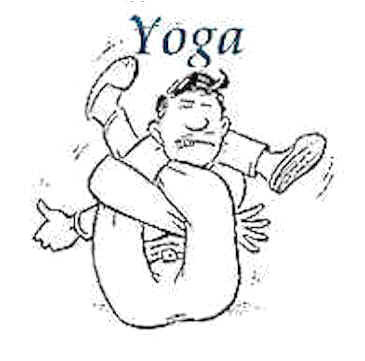 These are not different types of yoga but are different applications of yoga to daily life. Since Yoga means to unite they are all part of the whole. In addition to these, there is Raja, Tantra, and Integral Yoga. The concept presented is the body contains a network of channels for divine and cosmic energy. Where these channels cross, they create pulse points of psychic and spiritual energy in the body known as chakras. There are said to be as much as 88,000 chakras throughout the human body, but ... of these, only seven are considered to be of supreme importance, Each has its own corresponding color, musical sound, psychological function, stone and gems, symbols, endocrine gland, internal organ, illnesses and ailments. Tantra, sometimes called Kundalini Yoga, is the worship of God as the Divine Mother; (for those who are femininely inclined) it stresses the union of the male and female aspects of the individual, to awake the Snake. Tantra's most important and unique characteristic is its use of sexual imagery to portray enlightenment, the return to Oneness beyond duality of life. When Kundalini has been awakened, as a result of secret yogic techniques, she rises through the chakras of the spine slithering like a snake upward to reunion with Shiva at the crown of the head. When god and goddess unite in sexual embrace, enlightenment occurs, illusion vanishes, and there is only One. This rising Kundalini flow also causes one to go into an altered state of consciousness, as the heart chakra opens. This can be one of the most dangerous practices in yoga and is not to be underestimated in its ability to harm. Connected with the Kundalini practice is an elaborate occult system that sees the human body as integrated to within and without. The occultists world view is summed up by the statement as �within so without.� The Beatles sang a song influenced by the Maharishi �life flows within you an without you.� Yogis have the ability to slow down their breathing surviving on almost no oxygen and to remain motionless for hours, thus freeing themselves from the supposed �illusion� of this life. Without going into all the different aspects and functions of each yoga, I would like for us to examine the one most commonly practiced, Hatha yoga. The words Ha and tha represent the energy which is on each side of the spinal column. Hatha yoga suppresses the flow of energies through these passages, forcing the kundalini (�serpent power�) to rise from the base of the spine through the psychic energy channel in the sushumn (the spine), up through each of the chakras. The goal of advanced yoga students is to attain their highest possible degree of physical, mental, and spiritual integration. Ultimately to reach union with Brahma is not simply for exercise. It is a fact that yoga migrated to the west first as a spiritual discipline. At the time Vegetarianism and non-violence were promoted quite successfully as key elements of yogic philosophy. It actually helped change the culture and promote the hippie lifestyle which later transformed and matured into the new age movement we have today. Today it is now popular to bring the children to Yoga classes to calm them down from their hyperactivity and get them under control. The typical American taking yoga classes has little or no idea of the how�s and why's of yoga's seeming effectiveness. Yoga is a series of exercises and postures (asanas) which are advertised as a way to tone up, reduce stress and experience tranquility. In the traditional understanding, physical yoga has a great deal more to do with the practitioner's invisible, �subtle� body, than it does with the flesh and bones and muscles that encase it. While yoga does purport to first of all work on the muscular, glandular, and physical nervous systems, its real import, as Danielou says, is as �a process of control of the gross body which aims at freeing the subtle body.� (Danielou, p. 18 referenced from SCP Journal). This subtle body is extremely complex, but can be superficially described as consisting of 72,000 invisible psychic channels called nadis, which constitute an other-dimensional body that directly corresponds to the physical, or gross body. she subtle body is connected to the gross body at several points, which are the seven chakra points. Almost all those who practice new age therapies would be familiar with energy points called chakras. There is no Hinduism without its practice, it is essential and spiritual. There is no yoga that is strictly aimed for the physical body, it is essentially spiritual because of its purpose. Asanas (the body postures) are one of the first methods of arousing the Kundalini. Yoga is used to escape from this unreal world of time and sense which is called Maya, an illusion. The goal is to reach moksha, a Hindu Nirvanna. Yoga was developed as an escape from endless reincarnations. Georg Feuerstein, Ph.D., founder and director of the Yoga Research and Education center says that Yoga has two meanings: it�s the discipline and the actual union. When we have the union, we don�t need the gear anymore. But few people can claim to have reached that level. There are practitioners who have been allowed glimpses of it, but full enlightenment is a very rare accomplishment. The word yoga is Sanskrit; it derives from a verbal root, yuj, meaning �to yoke or join or fasten or harness, as in horses to a chariot; to concentrate the mind in order to obtain union with the Universal Spirit; to be absorbed in meditation.�' Its meaning in plain language is union or yoking with the God consciousness. B. K. S. Iyengar, the founder of the more popular form of Hatha Yoga used in the U.S. states yoga is, �the means by which the human soul may be completely united with the Supreme Spirit pervading the universe and thus attain liberation� (Yoga Journal, May/June 1993, p. 69 Quote from http://cana.userworld.com/cana_yoga.html ). The yoga teachers do admit that its function is spiritual not just physical. Focusing on a series of stretching exercises, breathing practices, and meditation to reach a state of peace and harmony, this physical discipline is merely a means to an end. It is a spiritual exercise and the spiritual awakening is really the serpent power (Kundalini) an energy that when released streams up the spine, where tremors, spasms and sometimes violent shaking and twisting are experienced. The yoga positions are designed to reach the state of Samadhi, or a state of union with self as God. Hatha yoga in its postures bring the subtle body into a specific alignment with the physical which will alter the consciousness of the participant. In other words one is practicing one of the essential elements of Hinduism when doing their Hatha Yoga exercises; whether they are aware of it or not. Swami Sivenanda Radha, a well-known yoga teacher, has said in the book on Hatha Yoga, �Asanas are a devotional practice...each asana creates a certain state of mind...to bring the seeker into closer contact with the Higher Self� (Quote from http://cana.userworld.com/cana_yoga.html ). Pranayama is the breathing process; by inhalation, exhalation one absorbs vital energy. Some claim by controlling Prana (life force), one can control all the forces of the universe, gravity (this why some claim to levitate), magnetism, electricity and their own nerve currents. Yoga is one of the basic means of reaching this altered state of consciousness. And the altered state is the doorway to the occult. Sir John Eccles, Nobel Prize Winner for his research on the brain, said the brain is �a machine that a ghost can operate.' In a normal state of consciousness one's own spirit ticks off the neurons in his brain and operates his body. We are spirits connected with a body. But in an altered state, reached under drugs, Yoga, hypnosis, visualization, this passive but alert state, the connection between the spirit and the brain, is loosened. That allows another spirit to interpose itself, to begin to tick off the neurons in the brain, and create an entire universe of illusion. You've then opened yourself up to the spiritual realm which God forbids for us to enter. It's called sorcery. Those encouraged to use meditation, yoga, visualization, chakra energizing, Spirit guides could certainly take advantage of these open areas. Unbeknown to many people they are literally teaching themselves how to be demonized, asking guiding spirits to help teach and relieve them of their stress. All in the name of stress reduction and developing one's full potential. The fact is that one practicing yoga, the Asana's, are to be able to release themselves from the trappings of reincarnation by working off their karma. Yoga is to help one neutralize their karma and find a way off the cycle of rebirth (reincarnation). How can this spiritual exercise by sanitized for Christian use. And for what reason would it be used? To relax! The Bible teaches God will �keep him in perfect peace, whose mind is stayed on You, because he trusts in You.� (Isa. 26:3). One cannot make an excuse that they want to us it to experience peace and or the divine. The poses that they so diligently practice in their stretching are named after Hindu Gods, and what one is actually doing, is calling on them. In that worshipful pose, they are bowing and for all intents and purposes worshipping that God. Our God says �You shall have no other Gods before me. You shall not make for yourself an idol in the form of anything in heaven above or on the earth beneath or in the waters below. You shall not bow down to them or worship them; for I, the Lord your God, am a jealous God. As Christians who are in relationship with the God who created the universe, we should not be among those who exchanged the truth of God for a lie, and worship and serve created things rather than the Creator (Romans 1:25). While many Christians rationalize the exercises as neutral they only need to ask a professional Yoga instructor what it is really about to find that it is in fact religious. As a Christian we need to ask ourselves would Jesus or the apostles be doing yoga? If not why not. Would they promote another religions way to be united with a different gods? According to the Bible Yoga is an idolatrous practice which leads one away from the one true God and into the spiritual realm of false gods and demonic spirits, and there are consequences? If we sin ignorantly God understands, He is merciful, giving us grace on the one hand, but not to continue after we receive knowledge of the truth. On the other He cares of our sin, not willing to leave us to our deception. �My people are destroyed from lack of knowledge.� In Hosea�s time people had a lack of knowledge concerning God. As a result, they turned to other gods, and their idolatrous practices became a snare to them and a delusion. They became the prey of false gods-even while thinking that their lifestyle was pleasing to the true God. There is absolutely no problem in stretching exercises in and of themselves. What would be wrong is taking yoga positions assuming they are stretching exercises and non-religious, when in fact they are worshipful poses to Hindu gods. No one can deny that stretching helps the blood flow, that breathing in oxygen helps our overall health. There are numerous other ways unattached to a religion that can accomplish this. There are numerous exercise programs that incorporate stretching that in no way relates to yoga (and it worldview) that one can substitute. Religious syncretism is probably the most dangerous we can involve ourselves in because we can rationalize its purpose. From the Hindu viewpoint nothing is merely physical, because in Hinduism the physical is merely maya, an illusion, so when you practice yoga it is not a physical exercise for the body but a spiritual exercise. All exercise helps the blood flow and keeps us limber. Breathing in oxygen helps our overall health and vitality. All these can be pursued in other ways than having it attached to a religion that teaches to discover you are god. Essentially one cannot practice a portion of Hinduism and continue to walk with the true Christ who is not a Hindu Guru. I AM THE WAY, THE TRUTH, AND THE LIFE. NO MAN COMES TO THE FATHER EXCEPT BY ME. � 2009 No portion of this site is to be copied or used unless kept in its original format- the way it appears. Articles can be reproduced in portions for ones personal use. Any other use is to have the permission of Let Us Reason Ministries first. Thank You. We always appreciate hearing from those of you that have benefited by the articles on our website. We love hearing the testimonies and praise reports. We are here to help those who have questions on Bible doctrine, new teachings and movements. Unfortunately we cannot answer every email. Our time is valuable just as yours is, please keep in mind, we only have time to answer sincere inquiries from those who need help. For those who have another point of view, we will answer emails that want to engage in authentic dialogue, not in arguments. We will use discretion in answering any letters.